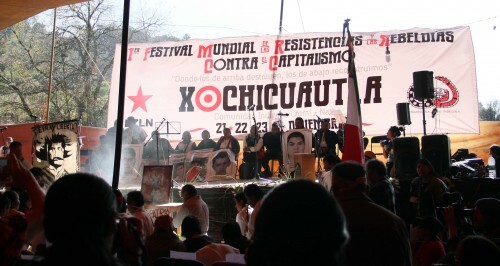 On 21 December, the First World Festival of Anti-Capitalist Resistance and Rebellion “Where those from above destroy, those from below rebuild” opened in the San Francisco Xochicuautla community, Lerma municipality, Mexico state. At the invitation of the Zapatista Army of National Liberation (EZLN) which provided them space, the parents of the disappeared students of Ayotzinapa led the event. Before the stage, 43 chairs were erected with the faces of the disappeared students, to demand their presentation with life. The event was attended by more than 80 organizations that comprise the National Indigenous Congress (CNI), which represents 35 indigenous peoples of Mexico, as well as adherents to the Sixth from 32 Mexican states and 26 countries. The “sharings” of the festival will be held in the community of San Francisco Xochicuautla, Lerma municipality, and in Amilcingo, Temoac municipality, Morelos, on 22 and 23 December. From 24 to 26 December, the Grand Cultural Festival will be celebrated in Mexico City. On 28 and 29 December the sharings will continue in Monclova, Candelaria municipality, Campeche, and from 31 December to 1 January, the Festival for Anti-Capitalist Rebellion and Resistance will take place in the Oventik caracol, located in the Chiapas highlands. Finally, on 2 and 3 January there will be held a plenary meeting for conclusions, accords, and pronunciations at CIDECI, San Cristóbal de Las Casas, Chiapas.